After potty training your children, you hope that you no longer have to worry about soiled clothing and accidents... unfortunately this isn't always the case. I do have to say, so far I feel pretty luck- we've only had two children with issues staying dry at night.... but they also have really struggled with this. I know I'm not alone, and neither are my kids. Night time accidents are definitely still an issue for many kids. According to About.com 15% of children still wet the bed at age 5, 7-10% of children still wet the bed at age 7, and about 3% of children still wet the bed at age 10. So, what can you do about it? For a lot of kids it's something they have to grow out of, but there are helpful methods out there to improve the night time experience. I was sent one of those products a few months ago to try out on our two boys who were still struggling with staying dry through the night. 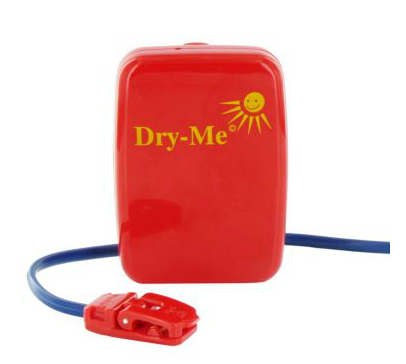 We were sent the Dry-Me Bedwetting Alarm to try out and tell you all about. 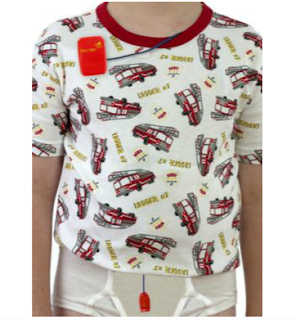 The alarm is small and lightweight and features a plastic clip molded directly on the back of the alarm unit, which clips comfortably at the shoulder area or collar of the child’s pajamas. The alarm’s small moisture sensor is threaded under your child’s shirt and is clipped to the outside of close fitting underwear where wetness would first occur. This bedwetting alarm is well made and designed to go off at the first sign of moisture. Our son who has the most accidents often does not even wake when he wets the bed... he only notices when he wakes up the next morning. He is a deep sleeper, so the alarm and vibration would be helpful to wake him from that deep sleep. The alarm has customization settings to suit your child's needs. You can choose the alert tone, add vibration, or select only a vibrating alert. So, how did it work? Well, I have to say that we never experienced the actual alert. Both our boys (both of whom had different trial periods with the product) were so nervous about the alarm that they must have slept light enough to wake up and use the bathroom before the alarm needed to do it's job. For this reason, I would love to see a "try" button of some sort for the Dry-Me alarm, so that the kids could get an idea of what the vibrating alert would feel like (the boys thought it would shock them, while the product will definitely NOT shock the child- it's hard to explain this to a child unless they can experience it). BUT- we still had dry nights. That was the ultimate goal, and it seems to have worked! We've probably saved a lot of money just in the laundry we've not had to do in the last few months (really, washing bed sheets and blankets nearly every day can be expensive)! The Dry-Me Bedwetting Alarm retails for $49.95 currently, or you can buy the starter kit- which includes the alarm, two washable waterproof bed overlays, and the book Seven Steps to Nighttime Dryness (price varies from $79.95 to $95.95 depending on bed size). I have been given the chance to help one of my readers overcome nighttime bedwetting by giving away a Dry-Me Bedwetting Alarm and the book, Seven Steps to Nighttime Dryness sponsored by Bedwetting Store. Enter by using Giveaway Tools below! I was sent the product in exchange for my honest opinions and this post on the product. I received no monetary compensation and all opinions are my own. This would be so helpful for my kids who struggle! The washable bedtime pant I think would also be nice to have to help save some money. Love the tuckable overlays. They would stay put under my wiggly kiddo! They have tons of stuff I want! The urologist recommended a watch from them and I'd also love some of the tuckable overlays! Wow, I had no idea they made one of these. I can see this being more comfortable for boys to wear than girls. This is such a great invention! I think one of the watches would be helpful! I think the Sofnit 300 Reusable Underpads would be useful. While dd rarely wets the bed anymore, those rare times she does, the HaloShield Odor-Eliminating Underpad would be handy! Oh I also love the NaturePedic Organic Waterproof Mattress Pad, Anchor Band Style!